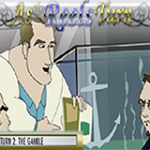 As The Reels Turn 2 is a 5 reels / 15 paylines slot game developed by Rival. The theme here revolvs everything happening at the El Paradiso club and as the name suggests this is the second episode in this series. This game picks up pretty much the same place the first one left us and this part is called “The Gamble”. There are several scatters here. The first one is the Ivan Fish symbol. 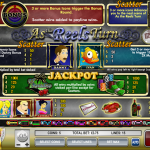 Landing 3 or more anywhere on the reels will reward you with 10 Free Spins with a 3x multiplier. The second scatter is the Bonus symbol and landing 3 or more will trigger the Bonus Round. Here you’ll help Matt G to find fake chips. real chips you find will reward you with a prize. The Third scatter is the Danny symbol and landing 3 or more will trigger a mini-game. Here you’ll have to select among several characters Danny plays. The one the crowd likes the best will will get you a nice prize. The Forth scatter is the Advance To The Next Round symbol. Landing 3 or more will literally advance you to the next round where you’ll be set in a new scene. This is obviously a game with a very complex story especially when you compare it to other similar slots. So you will really love it if you like to feel engaged and active in the game and in that case it will be very rewarding for you. Just like with the first game we think this one will also be worth your time! 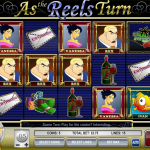 If you liked this game then try playing the original chapter As The Reels Turn 1 a 5 reel slot by Rival.